The Le Monde cabaret show is at the forefront for discerning Fringe-goers and is a must-see of the festival! Relax in our luxurious Dirty Martini lounge and let us treat you to our pick of the Fringe artistes featuring magic, comedy, burlesque, cabaret crooners and more. 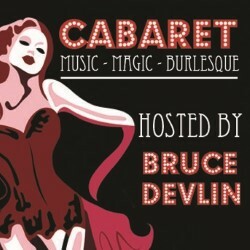 Hosted by the fabulous Bruce Devlin. 'Hugely enjoyable hour!' **** (FreshAir.org.uk).